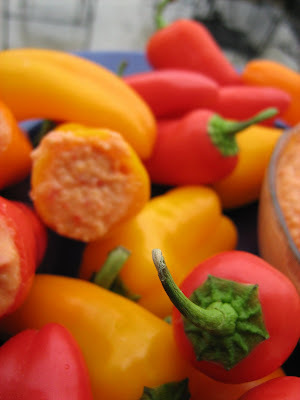 Has anyone seen these cute little sweet peppers at Costco? My kids have been gobbling them down by the handfuls. They look kinda tricky, like they might be hot, but they are not. They are so sweet and crunchy. The perfect size for snacking. As I was watching my daughter down her 10th pepper in a matter of minutes, I thought that these would be really cute as an appetizer or snack stuffed with something yummy. I always have garbanzo beans and I happen to have some roasted red peppers in the fridge, so I threw this hummus together in a flash. I cut some of the stems off of the peppers and cut out the few little seeds and then spooned some hummus inside, but just grabbing the pepper by the stem and dipping it in the hummus worked well too. Just furthers the idea that mini makes everything betteR! Preheat broiler. Cut bell pepper in half lengthwise; discard seeds and membranes. Place pepper halves, skin sides up, on a foil-lined baking sheet; flatten with hand. Broil 10 minutes or until blackened. Place in a zip-top plastic bag; seal. Let stand 10 minutes. Peel. 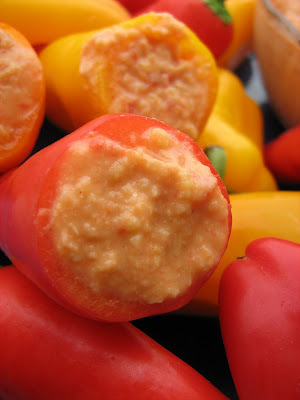 Place bell pepper and remaining ingredients in a food processor; process until smooth. I love the little peppers! And red pepper hummus is my favorite! I am obsessed with those peppers!!! What a great idea stuffing them with hummus for an appetizer...I like dipping mine but love how they look stuffed. Very cute!! Great hummus recipe! I posted your potsticker recipe today...they were so good! So cute! I'll have to keep my eyes out for those - imagine making cute stuffed peppers with pepper jack cheese! Yum! Hope you don't mind I added you to my blogroll so I can find you again! I feel like I'm always leaving a comment like, "I love xyz!" 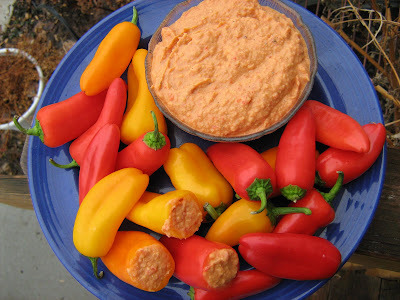 on your blog...but it's true--I love roasted red pepper hummus. I just saw the big bag of little peppers at Costco this weekend. Next time I'm there I'm buying them. I'm not going to rest until I find those peppers. You make the coolest food. These look incredible! You are so lucky that your kids eat veggies. I wouldn't eat sweet peppers until I was 22 years old! My mom hated it. I love those peppers at Costco and I buy them even though it's almost too much for just one person. I can't wait to try your hummus with them -- Thanks!